I like clicking my stopwatch." - legendary coach Gags (Frank Gagliano) in a Wall Street Journal profile on him and the NJ/NYC Track Club. 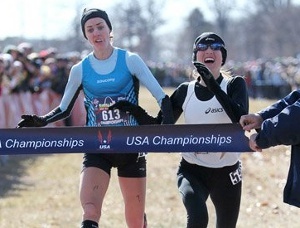 Julie Culley, Gags' athlete, is running the NYC Half on Sunday (watch live at 7:30 am eastern). It's her first half-marathon and apparently the first by a Gags coached athlete. Is Ireland really devoid of snakes? Kenyans MEN'S 10000m Olympic Trials FINALLY in the U.S, name your picks? Oscar P Runs 45.20, Gets Close To Olympic Selection Mrs. Wejo is pumped. Usain Bolt To Open Season May 5th At JN Jamaica Invitational With Asafa Powell, Yohan Blake, Kirani James, Carmelita Jeter, Shelly-Ann Fraser A great meet. Blake and Powell or Powell and Bolt will likely have to race each other. More on Bolt here. Preview Of Sunday's Oregon Preview Meet: Sally Kipyego Headlines It's the start of the Oregon outdoor season. Oregon's 4 x 400 team also is wondering if it can go sub-3:00 this year. Deep Fields Set For Seoul Marathon On Sunday CR oholder Sylvester Teimet and defending champ Abderrahim Goumri vs. 25 runners from Kenya, including James Kipsang Kwambai (2:04:27) and Eliud Kiptanui (2:05:39). Kenyan Flomena Chepchichir (2:24:21) leads the women. LA Marathon Is Sunday Rain and 50-degree weather is on tap. The field has 5 sub-2:10s and 3 sub-2:30s. The race gives away $110,000 in prize money and then a ridiculous bonus of $100,000 to the Equalizer winner. How about making the bonus $25,000 and giving the rest to prize money? *LA Media guide with bios on athletes. Italy's Cinque Mulini XC Race Pays Tribute To Grete Waitz, Who Was A 6-Time Winner Race will be a battle between 5,000m World Champs sixth placer Thomas Longosiwa and 2011 Euro XC champ Atelaw Bekele. Kenya's Daegu 10k 4th placer Prisca Jepleting highlights women's field. IAAF Preview Of Rome Marathon On Sunday Includes 7 sub-2:09 runners with Qatar's Nicholas Kemboi (2:08:01) leading field. March 25: Delilah DiCrescenzo Added To Chicago Shamrock Shuffle 8k Field This race also serves as a "elite club competition" between teams such as Hansons-Brooks, NB Silicon Valley, Indiana Team Elite and Wisconsin Runner Racing Team. Running Times: "The World's Toughest Race Is Missing In 2012" "The meet's reputation as 'the toughest race to win' came from the simplicity of the program: 12K race for senior men, 8K for senior women. ... runners were marathoners and milers, steeplechasers and road warriors, all in one event." *77-Year-Old Holocaust Survivor Runs Jerusalem Marathon Kenya's David Toniok won in 2:19:52. LRC 2012 Track & Field By The TV Numbers With the indoor track season now over, we thought we'd take a chance to look back and tell you how the indoor meets did on television (as well as on YouTube for Millrose). The stats reveal that new era hasn't taken over at all, as at least 5 times more people still watch track on television as on the Internet. Will The Half Marathon WR Go Down In 15 Days? Leonard Patrick Komon Going For Half Marathon WR At Prague Half On March 31st He is the current road WR holder at 10k and 15k and will be looking to break the 58:23 time set by Zersenay Tadese. Current world leader (59:11) Kenneth Kipkemoi is also in the field. 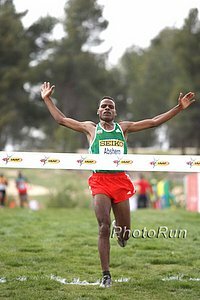 *Also April 15th: Kenenisa Bekele Up Against Top Spanish Runners At SPAR Great Ireland 10k Run April 15th Up against defending champ Jesus Espana and Euro XC silver medallist Ayad Lamdassem. (link fixed) Update: Alan Webb's Excellent Advice To Robby Andrews On Turning Pro "If you really love it, then it's worth it. But if you don't love the sport, then you're going to hate it as your job. It is a job. It's not your college team anymore. You're going to be getting a paycheck for this, so you got to love doing it." Robby Andrews Turns Pro Last week, LRC broke the news that Andrews was leaving the University of Virginia. Now the 800m star has done what most expected - turn pro. He'll be coached by Jason Vigilante and train with American mile record holder Alan Webb. He has not signed an endorsement deal yet but will be represented by Ray Flynn. LRC Men's 3,000m Final Lives Up To The Hype World 5,000m champion Mo Farah squared off with two-time world indoor champion Bernard Lagat and 2012 World leaders Augustine Choge and Edwin Soi of Kenya. Once again, Bernard Lagat was too good. They were all in contention on the final lap. There was some contact, two guys running on the infield, a DQ and a resintatement, but none of that stopped Bernard Lagat from showing he's the best 3,000m runner in the world. LRC Hellen Obiri Stuns Four-Time World Champ Defar link fixed Obiri Closes In 4:06.6 For Gold Get used to the name Hellen Obiri. Last year, she ran internationally for the first time and won the Kenyan 1,500m championships. This year, in the fourth 3,000m of her life, she came from behind to stop Meseret Defar from getting her 5th world title. IAAF Final Day Recap: Brittney Reese Is Incredible, Aries Meritt Upsets Liu Xiang, Will Claye Wins Brittney Reese had her back to the wall in the long jump, so what did she do? Unleash a jump that made her #3 all-time to win. Aries Merritt's Upset Of Liu Xiang Guarantees Record Medal Hall For Americans AP 10 Golds for US. LRC Saturday: Iguider Wins Thrilling Men's 1,500m, Dibaba Lives Up To The Hype, Ashton Eaton, Sanya Richards Ross, Chaunte Lowe And Justin Gatlin (Uh) Get Gold World Record And $90,000 For Eaton A tremendous day of action and a good one for the USA. We break it down, including the men's 1,500m, where Abdalaati Iguider ruined the coming out party of Ilham Tanui Özbilen in an exciting race that saw Matt Centrowitz challenge for the lead. Genzebe Dibaba dominated the women's 1,500, showing she's the real deal. Plus Sanya Richards Ross, Chaunte Lowe and Justin Gatlin are all back from various ailments, some self inflicted, some not. Not to mention a super-tight long jump and a gold by a 39-year-old married to a former heroin dealer. Daily Mail Criticized Tiffany Porter For Switching Allegiances, Arranged For Zola Budd To Do It Instead of ambushing Porter, shouldn't they criticize British citizenship procedures? On The Boards: Something is wrong with the 60m sprints in Istanbul Wejo did some analysis and the athletes are starting much slower than at the 2010 Worlds. LRC The Fastest Puma Faas Winners - Mark Wieczorek, David McNeill And Ricky Flynn LetsRun.com is made up of the most passionate and fastest runners on the planet. The three guys above entered the Puma Faas Challenge just like you even though they are total studs. Mark is a 1:46.00 800m runner, David a two-time NCAA 5,000m champion and an Australian national champion, and Ricky was a breakthough performer at the Olympic Trials Marathon. Read all about them. Thanks to Ricky's run at the Trials, he may be getting a sponsor soon, so he's giving his shoes to his roommate. Previous: Get Inspired With The Final 20+ Winners In The Puma Faas Challenge A guy with incurable cancer who wants to run 16-minute miles, a guy who want to break 4 despite getting hit by a car going 35mph, a woman who has a 5-year running streak going that includes two pregnancies, much more. LRC Haile Gebrselassie Tweets "My Olympic Marathon Dream Is Over" And Ethiopia Announces A Preliminary Olympic Marathon Team Missing A Few Stars Geb's tweet is big news as we'd like to see him make one final attempt to compete in the Olympics. Just as big news may be that neither Gebre Gebremariam, Tsegaye Kebede nor Fiyesa Lilesa were on the preliminary team. Their men's team is the top 4 Ethiopians from Dubai. More Geb: Associated Press Column: Should Gebrselassie Say Goodbye? His agent seems to think so. HAILE FROM TWITTER - "It looks like my Olympic Marathon dream is over." LRC Geb Goes For It ... Fades To 2:08:17 4th Well-paced, good weather, perfectly positioned, Haile G had the lead and a gap on the field at 36k but surprisingly faded and was passed one-by-one until he was off the podium in the final kilometer. It was a strange marathon, as both Geb and last year's defending champ Hailu Mekonnen, who were the two leaders, both faded after surging ahead. Michael Kipyego (2:07:37) brother of women's star Sally Kipyego, took the win while Arata Fujiwara stamped his ticket to London with a 2:07:48 PR. 38 y/o Geb complained of back pain afterwards. Geb is now known for his post-race excuses, but for once we tend to believe him (he also dropped a water bottle at 35k and stopped to get it before not picking it up - wonder if that affected his back). *MB: NYC Half 2012 race coverage thread and updates. LRC Preview Of NYC Half: Who Triumphs In The Big Apple? Most of America's best are set to take on some of the world's best in America's best half marathon on Sunday. On the men's side, Ritz and Meb lead the US charge versus Kenyan 10,000m champ Peter Kirui and young Ethiopian star Fiyesa Lilesa. On the women's side Kara and Desi will have their hands full with Caroline Rotich, Kim Smith, and NYC champ Firehiwot Dado. Latest: Wall Street Journal Profile On Gags Quotes from Vin Lananna in the article. Gags is coaching Julie Culley. It will be her first half marathon and believe it or not Gags' first one too as a coach. RRW: NYC Half Athletes Getting Recognized in New York City Desi: "I got a high five in [Central] Park yesterday and some girl turned around and was like, 'Oh My Gosh!" Brief Chat With Meb Keflezighi "A year ago at this time I was like trying to scramble ... but we've just got to be patient for the light at the end of the tunnel for things to turn around. In life, you always have your ups and downs, ups and downs, but if you're patient enough to wait then good things will happen." Running Times Article On HSer Erin Finn, Who Shattered The 5,000m NR At NBIN She ran 16:19, but went out at about 15:30 pace. "That's how I’ve always raced. Just go out until you die. There's no sense in not doing your all. I want a race to be a race." 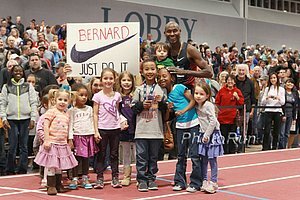 Kenyan 10,000m Trials In Oregon! It's Official: Only The Kenyan Men's 10,000m Olympic Trials Will Be Held At Pre Classic No 5k, no women's 10k. Top 2 automatically on Olympic team with 3rd wild card spot. Ken Goe Article Says that there is a rumor that the Pre Classic was never very interested in the 5k and AK will probably select the women's 10k team without a trial. Athletics Kenya Fighting As Usual To Drag Athletes To Pre-Olympic Training Camps They've threatened agents with sanctions if they don't find their athletes within 24 hours. "Olympic Movement's Most Influential Figure In the Western Hemisphere" Mario Vazquez Raña Resigns From IOC It seems the 80-year-old was subject to a mandatory retirement age rule. In his 4-page long statement, he gave insight into some of the "behind-the-scenes political infighting" in the Olympic movement. Top Russian Racewalker Surprised To Hear Race Walking Gets Mocked In US And UK Apparently it's a lot more popular in Russia. 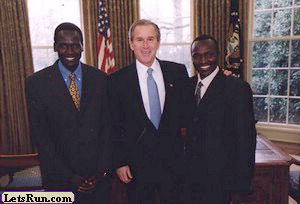 Impressive: Peter Kirui Paced Both The #1 And #2 Fastest Marathons Of All-Time He was part of the pace team that led Patrick Makau to his WR in Berlin and Wilson Kipsang to his 2:03:38. In Frankfurt, he decided to finish and ran 2:06:31. He's using NYC as a tuneup for Rotterdam, which will be the first marathon he will start with the intention of finishing. Good Interviews With Kara Goucher And Dathan Ritzenhein Ritz: "For me, I've completely flip-flopped from 2008. After the trials in 2008, Kara said [to me], 'Man, you must be so happy and so relaxed - you made the team eight months out.' And I was. I gotta tell you, it was such a different feeling." Ed Moran Back In NY For His Half Marathon Debut He ran his full marathon debut in NYC, which made him the 7th fastest Olympic Trials qualifier, but unlike Meb, 69 days wasn't enough time for him to recover, and even though he "made an attempt to come back," he decided to opt out and focus on the track trials 5k/10k. Kara Goucher And Shalane Flanagan Visited London To Run Olympic Marathon Course Goucher on the course: "It's a combination of a lot of fast running, tedious turns that break your rhythm, and then flying fast. Doing that three times is going to wear on you." Recommended Read The New York Times Introduces Kirani James To The World James has risen from poverty and a tiny party island to world champion in a very short period of time despite having an awkward left foot plant that "experts" have insisted he change (remind anyone of Michael Johnson?). James, just 19, is still a full-time student at the University of Alabama, as anything less than that and he'll be deported. Crazy. He already is #3 all-time at 400m indoors. Olympic 100m Champ Shelly-Ann Fraser-Pryce Tells Fans - Don't Be So Critical "It's not that day for you to be telling us, 'Oh, you're worthless, you're not supposed to be doing that' ... instead of saying, 'Good luck next time. All the best when it comes again.'" LRC 3,000s: Chris Derrick Pushes Lawi Lalang To The Line, Emily Infeld Wins Her First Title (link fixed) Friday night, Chris Derrick won accolades for coming within 1.7 seconds of beating Lawi Lalang. Derrick did even better on Saturday night, coming within .17 seconds. In the end, Derrick's efforts weren't enough, as Lalang completed the double. In the women's 3,000m, Emily Infeld won a four-person sprint around the final bend over (among others) Jordan Hasay. Hasay's Ducks were so good they would have won the team title if she had stayed in Oregon. LRC Mile, 800 And Team Recaps: Chris O'Hare Goes Wire-To-Wire, Jordan Hasay Tries To, Mason McHenry Surprises In 800, Nachelle Mackie Gets Another BYU 800 Win, Oregon, Florida Three-Peat After beind edged out last year, Chris O'Hare went gun-to-tape to win the mile, while Jordan Hasay tried to do the same but just came up short. In the 800s ASU's Mason McHenry showed what running your best when it matters can do for you, and Nachelle Mackie made it two years in a row for BYU wire-to-wire victories. In the team competition, Florida three-peated thanks to Jeff Demps (60m three-peat), Tony McQuay (45.77 400) and Omar Craddock (triple jump win). Oregon three-peated on the women's side and was led by Jordan Hasay's 11 points, plus English Gardner winning the 60 and Brianne Theisen the pentathlon. Curtis Beach Sets Six PRs And Runs 2:23 1,000m To Get NCAA Heptathlon Title Beach ran 1:50 for 800 in high school and could be a mid-d runner if he wanted to. 2:23 is incredible for a multi guy. Discuss here. LRC 5,000s: Chris Derrick Puts Up A Brave Fight In 5,000m As Lawi Lalang Wins The Title, Betsy Saina Holds Off Deborah Maier Chris Derrick may not have won the men's 5,000m on Friday night but he earned a lot of people's respect with the way he challenged the fastest-ever 5,000m runner in the NCAAs, Lawi Lalang. In the end, Lalang had too much the final 200. On the women's side, Betsy Saina got her first NCAA title despite a tough challenge from Deborah Maier. OTB: Chris Derrick... WHAT A RUN!!!!!! *CMON DERICK, DO IT FOR AMERICA!!! *Debbie Maier is Rockin it! LRC DMRs: Notre Dame Surprises And Katie Flood Lives Up To The Hype To Get Washington The Title Notre Dame's Jeremy Rae holds off IU's Andy Bayer and BYU's Miles Batty to get the win. Katie Flood runs fastest women's mile of the day to get Washington the win over Oregon, Dartmouth, and Georgetown. LRC Mile And 800m Prelim Recaps All the big favorites through, but a couple of surprises. Great Read: Excellent Profile On Katie Flood From Des Moines Register According to her mom, Flood ran a 6-something-minute mile with no training as an 8-year-old. Tough Standards For Inaugural IAAF Hall Of Fame Athletes need to have won at least two Olympic or World Championships gold medals and set at least one WR. Ridiculous. Amby Burfoot: "Love the New IAAF Hall of Fame Idea. Hate the Entry Requirements" He points out that the standards keep out great runners like Joan Benoit Samuelson, Frank Shorter, Roger Bannister, and even Paula Radcliffe unless she wins gold in London. Joe Battaglia: "Wang Junxia's nomination to IAAF Hall of Fame a cruel joke" "There is never a second chance to make a first impression. It's a shame that this inaugural IAAF Hall of Fame induction will be punctuated with a question mark." 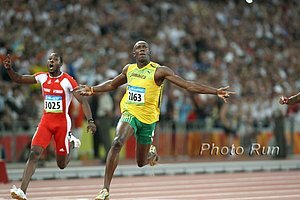 After Great Winter Training, Yohan Blake Is Dreaming Of Upstaging Usain Bolt And Winning 4 Golds Himself Both Jamaicans are dreaming of 4 golds, but Blake has been hot in training, whereas Bolt is MIA. 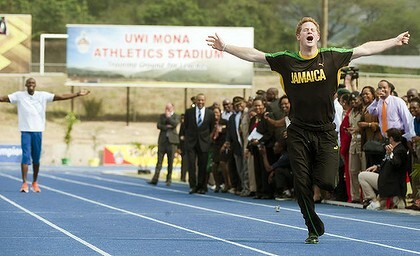 Blake: "My 4 x 400m training is going really well. I've been really encouraged by my performances." *Australian High Performance Manager Is Full Of Praise For Mottram "What he did in the race against Collis was tantamount to Mottram re-establishing himself in our psyche that he is the No.1 man over 5,000m. And once he has that confidence behind him, we then know with the right training and the right progress he's one of the rare distance athletes that can shake it up with the Africans." 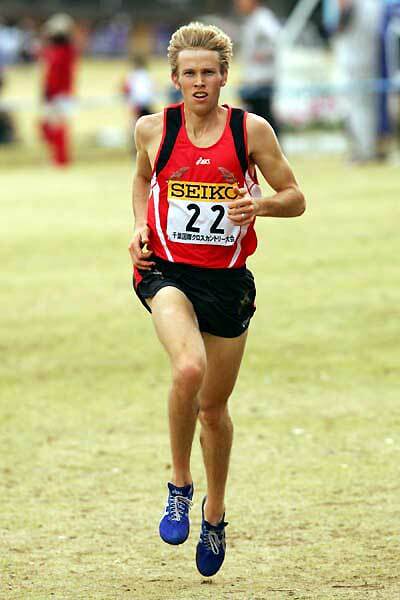 On The Boards: *Symmonds ran 1:48 in Melbourne, Sure, it's March Nick, not August! Day 1: Ryan Gregson Wins And Does A Dance As Kiprop Falters For 3rd Year In A Row - Torrence 2nd, Willis Third On a windy day, Asbel Kiprop had the lead in the middle but faded to 5th (3:42.52) as Aussie record holder Ryan Gregson got the win (3:38.51) to prove he's at least temporarily over last year's injury problems. He was followed by Torrence (3:39.32), Willis (3:39.77), Riseley and Kiprop. 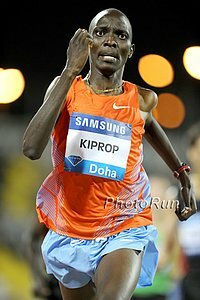 Kiprop: "I don't know exactly what happened. It was not my day today ... I did 10 seconds slower than what I was expecting. It doesn't disappoint me at all." 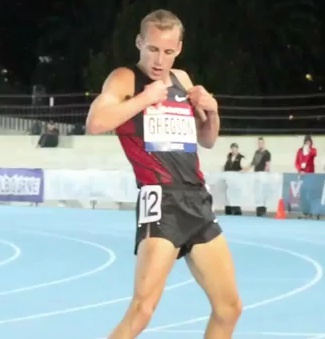 IAAF Recap Afterwards, Gregson did a dance at the finish (video embedded to your right or here). Was it because of this tweet? Meet The Triathlon Coach Who Taught Ryan Hall He Needed To Recover More No, the name of "Mr. Recovery" isn't God - it's Matt Dixon. Dixon seems to be a smart guy who had one triathlete cut his "volume by 30 percent, added easier workouts and had him eat more." We'd say that would help 90% of all distance runners if only instead of cutting their volume by 30%, they increased it by 30%. "Our goal is not to train as hard as we can, but to perform well." Salazar Says "Mea Culpa" And Takes Blame For Aggressive Race Plan That Blew Up And Cost Galen Rupp 3k Spot In Albuquerque They knew sitting and kicking would result in a Lagat slaughter, so they tried to take it out hard but they underestimated Lopez Lomong. "(Lomong's) always been a great runner," Salazar said. "We totally respect him. But he hadn't run a distance race in a while. We underestimated what he could do. It was a mistake." Sunday: LRC Manzano Outkicks Centrowitz And Rupp To Win 1,500, Simpson Holds Off Martinez (Updated) Two weeks ago, Manzano ran 3:57 in his opener but was last place in a super-stacked mile in Arkansas. In the women's 1,500m, Jenny Simpson edged Brenda Martinez, showing Martinez is the real deal (Martinez had by FAR the best finish as she got boxed and was 6-7 meters back with 100m to go and barely lost), and Sanya Richards-Ross ran a 50.71 meet record. Chaunte Lowe set an American record in the women's high jump, showing she is more than back from maternity leave. Distance recaps, results, and videos with winners. 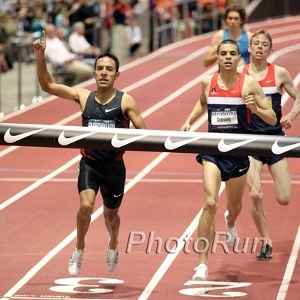 On The Boards: Manzano outkicks Centrowitz and Rupp! 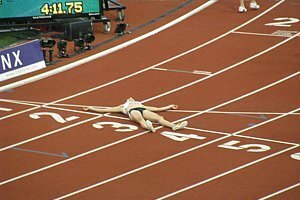 Really, what happened Rupp in the last two laps tonight? LRC USATF Indoor Men's 3k: Lagat, Lomong Crush Rupp (Updated w/ video interviews) Galen Rupp pushed the pace early, hoping his 12th attempt at beating powerhouse Lagat would be the charm, but was badly dropped before the bell, unable to challenge Lagat, who then crushed Lopez Lomong with a 25-second last lap. On to Worlds for Lagat, where he may be the favorite to defend his title. Like Lagat, Jenny Simpson ran away with the women's 3,000m title. Find out why she won't be running in Istanbul. *IAAF Recap Day 1 Will Claye jumped 17.63m in the TJ for the furthest mark by an American in 23 years. *Jennifer Suhr Overcomes Aching Achilles To Win PV At US Champs She only had to clear two heights and then made 3 attempts to break her own AR, but missed. 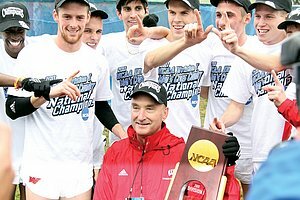 LRC The Week That Was In Running: March 5 - March 11, 2012 This week, we wonder if the NCAA milers could have beaten Bernard Lagat at Worlds if they'd jumped into the 3k with a mile to go, compare Chris Derrick to Galen Rupp, tell you how Meseret Defar was beaten at Worlds, tell you how many NCAA runners would have medalled at Worlds, pay homage to the great Mizuki Noguchi, and also explain why indoor track in many ways is better than outdoor track. He talks about how he had to have surgery in September after he tripped over his dog, giving up his 2011 Worlds spot, his 9-minute mile first run back, and his plans for outdoors. Video below. Larger here. Final Day Recap More from MileSplit here.